Marc, to be true we both don't know what you mean - can you please post us a link 'cause we would really like to check the pages - thank's! Lepanthes Glass now with light - not really meant to provide the plants with light but to enjoy the glass'es appearance in the evening when daylight is gone. We made a small whole in the base of the glass to prevent the moss on the base to get too wet as the clay tube loses water drop by drop. Last edited by naturegirl72 on Thu Jan 19, 2012 1:12 pm, edited 1 time in total. Wich led light did you used for that ? 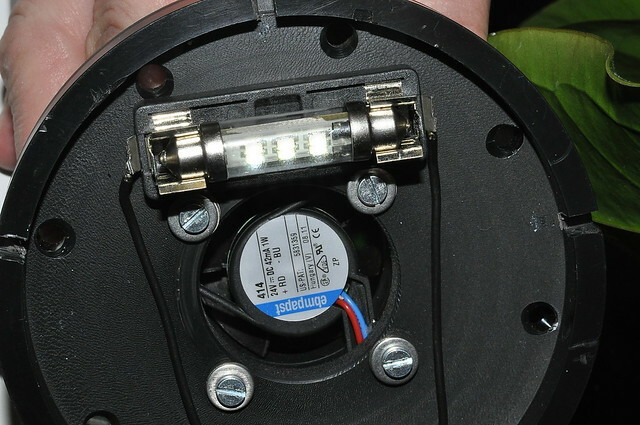 WOw don't know this kind of Led, can you please send me the information about it ? serial number, name of the firm to try to find some in France. Or maybe a website in germany where it's possible to roder some ? Amazing , this is the living proof that Germans are born engineers I would not have thought the moss would develop so green. I wonder about the possible problem arising if the jar gets sun rays and acts as a magnifying glass (heat) on the upcoming plants. Oops I missed part of the posts... I guess you solved that problem too..
Didier, thank's for your nice compliment - the jar is supposed to be situated to have bright light but no direct sunlight. Perfect !!! Thank you very much ! Two and half months ago I posted the last photos of our "Lepanthes Glass". Five days ago we finally got our "inhabitants" 3x Lepanthes telipogoniflora and 2x Lepanthes calodyction. 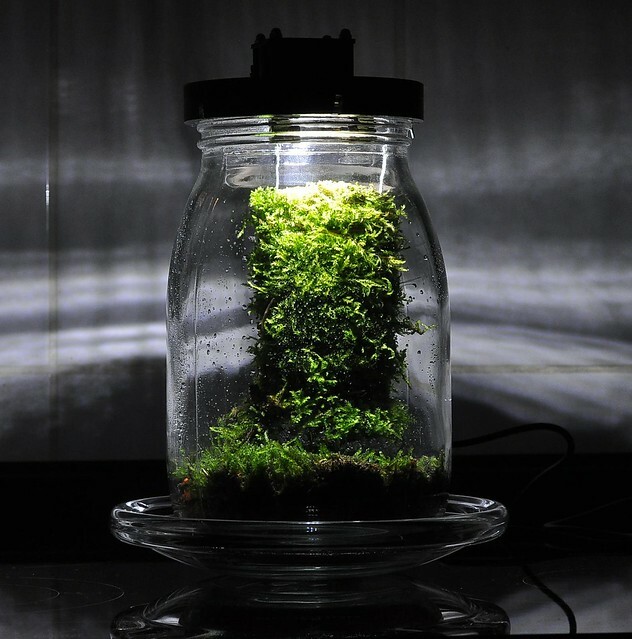 The moss was still alive and growing, no traces of mold or rot - should be a good sign that at least for the moss our Lepanthes Glass works well. Congratulations, Sylvi und Olaf. The leaves are beautiful and the tiny red flower is adorable. Please keep us posted on this project. OOO MM GEE! that is too cute!!! great work! this is amazing, please keep us updated!!!! Being a fan of minitures I am awestuck by the beauty of these guys. 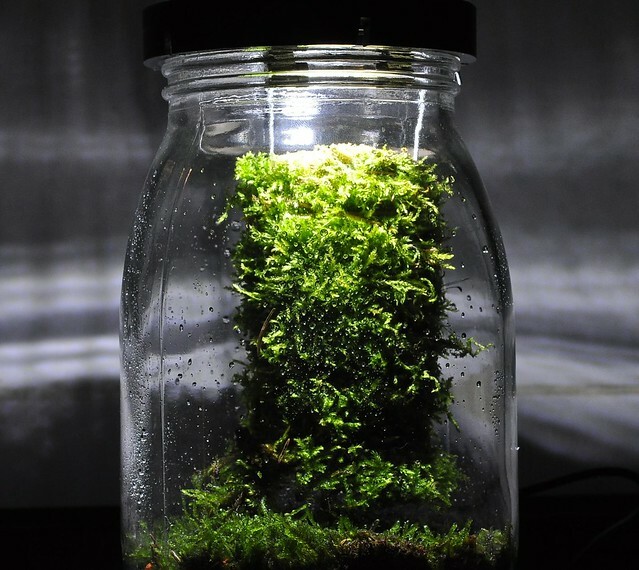 Never thought about growing them in a jar...sometime simple is best. Lucky me still had an surplus vanda glass in a cupboard and Olaf planned and assembled an adaptor for the lid with the little fan. Instead of one LED lamp Olaf installed a second one to get more light and the little fan doesn't run anymore 24hours (humidity gets below 65% so) - but from 10 am to 10 pm every two hours running for 10 minutes. During night we had about 90% humidity and during the day about 80%. We will see whether that works fine for the orchids.